We have discounts for stays of three nights or longer and 25% off for week or longer stays! Now till May 15, Arrive on Monday or Tuesday and spend three nights in any new cabin for only $345! > For more information about Lake lure go to: Welcome To Lake Lure! Jim's cabin maximum occupancy is six. Tootsie's Cabin maximum occupancy is four. Wandering Bear's maximum occupancy is two. Raven's Roost maximum occupancy is four. Evergreen's maximum occupancy is six. All New Cabins: maximum occupancy is two. 2 night minimum for all cabins. Check-ins welcome any day of the week. Please note - If occupancy of any cabin is more than the stated maximum occupancy, you may be asked to leave with no refund and/or there will be a charged of $100 per extra person per night. You will receive a conformation email as soon as you make a reservation. When the second payment is processed you will receive an email with your itemized statement and an email with directions and the code for the key box. You do not check in at an office, you go straight to the cabin. We accept MasterCard, Visa, and American Express. Reservations cannot be confirmed or "dates held" until payment is made. When making a reservation you agree to the following statement; When using a canoe, I assume the risks inherent in canoeing. I hereby release and agree to indemnify and hold harmless Pine Gables Cabins, its owners and employees from any and all liability that may arise as a result of this recreational activity. I agree that at all times there must be one Personal Flotation Device in each boat per each person, and I accept responsibility for there being such devices in the boat for each person. I agree that children under 14 years of age and any non-swimmer must wear a life jacket at all times, and I accept responsibility for each such child and/or non-swimmer wearing a life jacket at all times. Many guests have enjoyed our cabins on motorcycles. Our driveway is gravel so be very careful with sport bikes. All motorcycles must have proper mufflers. Please call or email before bringing trailers, motorhomes, or extremely low-clearance vehicles. The prices do not include 11.75% Sales and Occupancy taxes. Active Military or Return Guest? Please let us know and we'll have a bottle of wine in your cabin for you to say "Thanks!" We are pet friendly! We love animals and want you and your pet to enjoy some time in the mountains! We do charge a $35 "pet-fee". We then donate 1/2 to theThe Blue Ridge Humane Society or the Rutherford County Community Pet Center. *We allow only adult dogs. No puppies under 1 1/2 years old, please. Your dog must be friendly, housebroken and de-flead. How can I make a reservation or contact you? When your second payment is processed we will send you an email with our personal phone number so that you can call us if you have questions or concerns. This system allows Jim or Robin to personally answer all phone calls, emails, and reservations to ensure quality customer service for our guests. And yes, we really are a "mom and pop", not a "big business"! We ask that there be absolutely no smoking inside the cabins. There will be a mandatory minimum $250 cleaning fee for smoking in the cabins. You are welcome to do so on the porch. Absolutely no bonfires, campfires, or fire pits permitted on the premises. The risk of a wildfire is simply too high! The complete rental agreement can be found by clicking here. 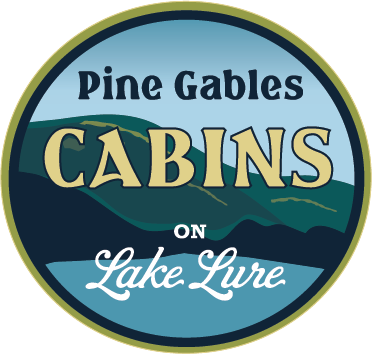 We are proud to offer you our accurate availability calendars and online reservations for Pine Gables Log Cabins! We look forward to having you as our guest at Pine Gables Log Cabins, be it for a weekend, week stay, Midweek Special, or Honeymoon Package.